We welcome you to explore the many offerings of our graduate programs here at FIU. FIU has the highest Carnegie Research Classification, “Research I: Highest Research Activity.” The reputation of a research university is based in large part by the quality of its graduate faculty. However, graduate students are also key contributors to the University’s reputation and active contributors to the University’s intellectual and creative environment. Through its graduate faculty members, FIU offers graduate programs of the highest quality. The Graduate Catalog provides information and resources to those interested in graduate education programs at FIU, including the full range of programs and courses available. We offer a wide range of graduate programs to satisfy virtually every personal or professional pursuit. We have over 120 graduate degree programs including an extensive array of doctoral, master’s and graduate-level certificate programs. 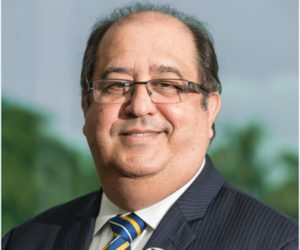 Florida International University is a young, vibrant and diverse university with a graduate population of over 8,000 students and an overall enrollment of over 54,000 students. We have an active Graduate Student Association and other avenues for graduate involvement on campus through the University Graduate School and other student services offices. At FIU, we take pride in designing graduate programs that prepare our students to be future leaders in their fields and to be knowledge creators. Our graduate faculty are worlds ahead scholars producing new discoveries to solve the challenges facing our nation and the world. Our focus on research-integrated graduate curricula, and the rich cultural diversity of our campus and South Florida, provide the graduate students with the most exciting and dynamic learning environment at FIU. FIU also offers excellent infrastructure for cutting-edge graduate work. We have modern, well-equipped laboratories, and ample computer facilities and support. We also boast one of the largest libraries in the State University System. All of this is available to our graduate students to help them achieve their goals in a timely manner and obtain the postgraduate appointments they desire. We also have excellent professional training and development opportunities designed to prepare the graduate students to be successful in their chosen careers. We are glad you have chosen to be a part of our rich academic culture, and we are committed to providing you with the most stimulating learning environment.